Homeschool Planning with Kids - Look! We're Learning! It’s that time of year! Time for everyone to break out their homeschool planning ideas! School year planning is probably one of the most exciting times for me personally. I get to look at my kids’ progress over the years, feel sad about how much they’ve grown (sniff), and get excited about what we’ll learn in the upcoming months. In my fantasy, I’d go on a homeschool planning retreat. Close your eyes and imagine a homeschool mom’s spa, where you are surrounded by binders, planning sheets, unlimited pens, pencils, and highlighters, wall-to-wall curriculum, and lots of other moms (separated by their kids’ grade level) that you can ask for suggestions. You can even get a pedicure as you chat! Perfect, right? But in real life, I have four children under age 10, a part-time job, I’m in college, my husband works full-time, and we have one vehicle. So that’s not going to happen. Instead, I have to use a few tips to get my planning done before the year begins. 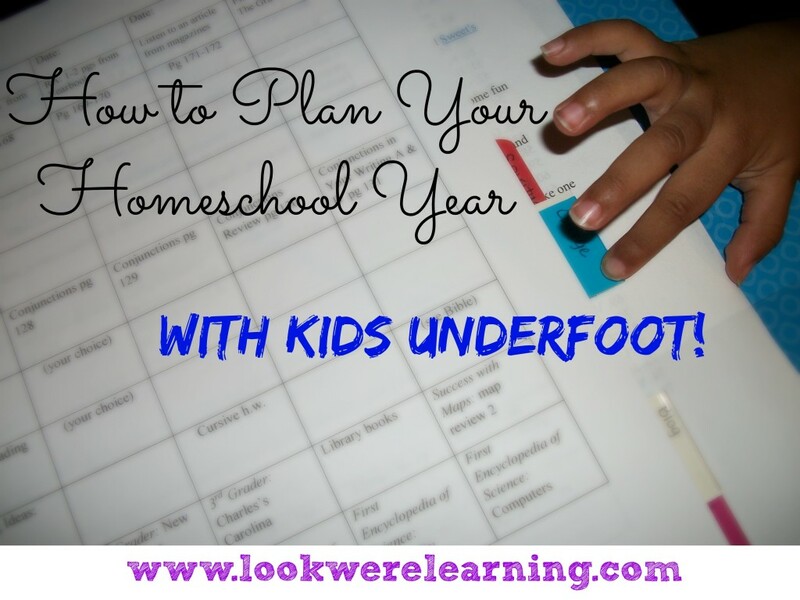 So – here are my suggestions for getting your homeschool planning done with kids underfoot! Jot down your ideas. I always have a ton of ideas about the kind of curriculum I’d like to use and the topics I want to cover during the day. Unfortunately, they get lost among a sea of dirty diapers and dishes. Now, I jot them down as I go and then wait until later to look at them and brainstorm my plans. Ask your kids for suggestions. I always try to give the kids a little say in what we cover each year. I have my list of objectives that are required by the state, but I still ask them what they would like to learn about. I usually find a way to work those topics in during the year. Enlist their help to move supplies. Each year, we take out the resources we’ll be using the most for the year and keep them in a crate in our schooling space. At the end of the year, those resources go back into our homeschool closet and we sort through our new year’s materials. Get your kids to help you with all that moving. It helps them burn off energy and saves your back! Break it up into sessions. As much as I would love to visit my homeschool mom’s spa and have a week to plan my school year, that’s not going to happen. Instead, I do a little bit of planning each day for about a month. July is my primary month for planning, but I generally do another, smaller planning session during the month of December. Reserve a special planning time beforehand with your spouse. If you absolutely need a few hours away to get your ideas together (which I sometimes do), talk with your spouse ahead of time and make that appointment with yourself. Give yourself two or three kid-free hours with your favorite homeschooling planner and a cup of coffee or tea. It’s heavenly! Do you have any more tips and tricks for getting homeschool planning done when you have small kids? I’d love to hear them in the comments! For even more homeschool planning suggestions, follow our Homeschool Planning board on Pinterest! Follow Selena @ Look! We’re Learning!’s board Homeschool Planning on Pinterest. Wonderful and inspiring ideas. Sometimes I love lesson planning and other times I just really despise it. I find that prayer before planning helps my direction and focus. I’m able to concentrate more and come up with some wonderful projects for the kids to do. Thank you for the great post! I also use homeschool tracker which keeps my lesson plans for me so it helps when we are using the same curriculum later one for one of the younger kids. Prayer is a huge help! It certainly relieves the pressure, which helps us to think better. When I find myself hating lesson planning, that’s usually a sign to step away for a while…lol. Thanks for visiting! Great tips. Selena, where do you get your grade-level objectives for Georgia? Hey Leigh! Last year, I just looked at the Common Core objectives and that’s probably what I’ll measure against this year as well. This Homeschool Moms’ Spa you speak of…I think you’ve really got something there! Blessings on your school year! Hmmmm, I think there’s a business idea hiding behind this “homeschool planning retreat” you’re referring to! Sounds heavenly! I love your tips and suggestions here. I’m poking away at the planning for next year (aka – 1 1/2 months from now) but I ‘m super excited about it. I love planning. I know! It could be a terrific business model in the right region, I think. But that’s for someone with a lot more money than me to do…lol. Great tips! I too have kids under foot and this is my first year so I’ve felt a bit overwhelmed! I trust be such a challenge to get anything done with four being homeschooled. Great advice! Great tips, I am not sure if I would be able to home school ever but if i do this is great advice! I home-schooled my two youngest. It was a lot of work, and they were much older that your children. I admire your ability to keep a handle on things. Well, I don’t always keep a handle on things…lol. But it’s getting better as the years go by. Thanks for visiting! I love how you get your kids involved in making the curriculum – I’ll keep that in mind in the future. It really seems to help them get excited. Plus, it gives me a framework for unit studies, so win-win! Thanks for visiting! I also homeschool, I’m an ESL teacher. I agree with asking the kids for suggestions, I try to do that as much a sI acn. ESL is a career field I’m considering after I graduate. 🙂 Thanks for stopping by! These are wonderful tips as planning can very quickly become overwhelming. Asking children was interests them is so wonderful to hear someone suggest as it can truly lead to some of the best hands on interactive lessons throughout the school year. Your post made me giggle! I hired my oldest daughter (19) to come over and watch the littles while I STARTED organizing and planning for the homeschool year. I have things scattered all over the house/basement, so I have to pull all the resources together so that I can see what I still need. Thank you for linking this post up in the Bloggers Brags Pinterest Party, hope you can come again soon! Ha! Now I just need to take my own advice and actually plan our first six weeks of lessons…lol. Thank you for linking up with The Natural Homeschool! Flexibility and patience are my best tips…though they can run thin at times (I say with a young girl having a temper in the background over not wanting to pick up paper she’s cut up all over the floor). Thanks for linking up to Mom’s Library, I’ll be featuring you this week at Crystal’s Tiny Treasures.